Heat olive oil in a large stock pot on medium heat. Add the torn pieces of prosciutto and sauté until crispy. Remove the prosciutto from the pot and set aside. Leave any remaining oil or bits of prosciutto in the pan as this will enhance the flavour of the soup. Add the butter to the pot and melt on medium heat. Add the leeks, celery, onion and garlic. Sauté until soft but not browned. Add the potatoes and stock and bring to a boil. Reduce heat and simmer uncovered until the potatoes are soft, approximately 20 minutes. Allow the soup to cool a little and then puree with a blender, food processor or stick blender. If using a stick blender, blend right in the same pot, otherwise, return the puréed soup to the pot after blending. Add the cream and stir to combine. 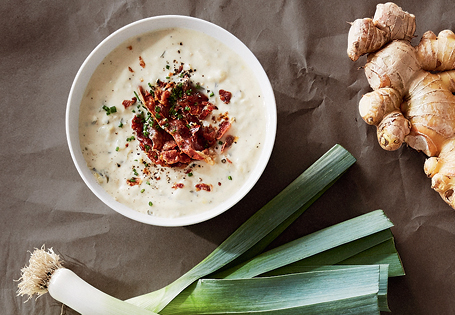 Ladle the soup into individual bowls and garnish each bowl with a few pieces of the crispy prosciutto, a sprinkle of chives and salt and pepper to taste. Serve hot.